If you’ve already been lucky enough to see Guillermo Del Toro’s latest film, The Shape of Water, then you know how beautiful it is to behold, visually. 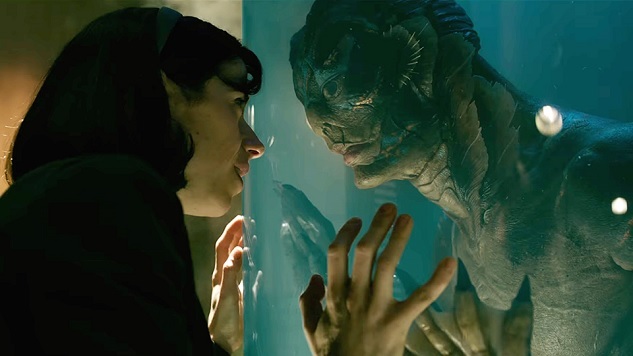 Although sumptuous designs are a core part of Del Toro’s identity as an auteur, The Shape of Water takes things to a level equaled perhaps only by Pan’s Labyrinth. Sporting a vibrant color palette of shimmering blue, green and aquamarine, the film both accurately evokes its early 1960s setting and simultaneously casts a spell of magical realism, as evidenced by the grand old movie palace where the protagonist lives in a crumbling (but somehow opulent) lofted apartment. The film is absolutely filled with visual moments that will stick in the audience’s mind for weeks afterward. That’s why it’s so shocking to hear that The Shape of Water was almost a very different film in a visual sense. According to Del Toro in a long, excellent interview with The Wrap, he was torn between making the film in color or in black and white, and was at one point leaning toward the latter. It doesn’t take a genius to conclude that this would have resulted in a film with a very different inherent feel, while increasing the strength of the perceived influence from other black and white films such as Creature From the Black Lagoon. Apparently it came down to Fox Searchlight telling the director that he would have a $20 million budget to make the film in color, or a $17 million budget to make it in black and white—both being absolute pittances, considering how gorgeous the film turned out. For the sake of the film that resulted—one that we think has a definite shot at several Academy Awards for 2017—let’s be glad that we got to see Del Toro use his beautiful colored pencils in The Shape of Water. But with that said, if he wants to give us a black and white film next, we’re all for it.